The Six Bells public house is still operating (as at 2010) at 148 and 149 High Street. 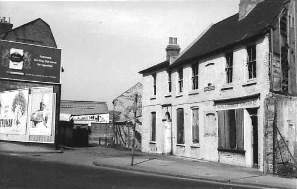 Behind is St Lawrence's church, redundant in 1961. 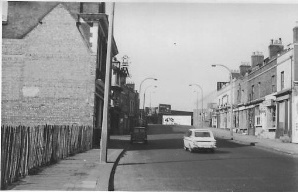 This looks like a side street but is the High Street, looking west towards Brentford Bridge. The sign of the Six Bells is visible on the left. 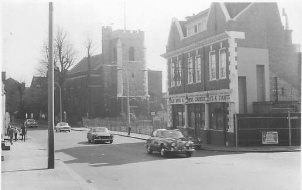 The terraced properties on the right rarely feature in postcards, the preferred view being from Brentford Bridge looking eastwards towards St Lawrence's church. They are numbers 159 to 170, now the site of the Brentford Lock Development. Find out more about the properties in this area. View along Durham Wharf, including 171 and 172 High Street. This was the home and offices of the Buck family, canal carriers and lightermen, until around 1970. See 'Then and Now Brentford' by Carolyn and Peter Hammond for similar views from the 1950s and 2006 or find out more about this property.